This product works GREAT ! Had two Honeywell products before this iteam. They were junk.This one is faultless. Only thing about it I don't know is the battery life. The Win 100 is an outstanding product! I purchased the Winn 100 to control the Infrared healting element I use to heat my barn where our prized dogs sleep. I am totally pleased with the way this device works. I have it set to turn on the 1200 volt infrared light (which is attached to the barn wall) when the temperature drops below 55 degrees and it works flawlessly 24/7. The Winn 100 not only keeps our dogs comfortable during the cold months but it also saves us $$$ on our light bill. I am thrilled with this product and I know you will be too. You won't be dissapointed!! Not much to say, this product is great. I use it to enable a couple of fans on the second floor when it gets too hot upstairs. Why didn't anyone think of this before! Best outlet thermostat I have ever used! 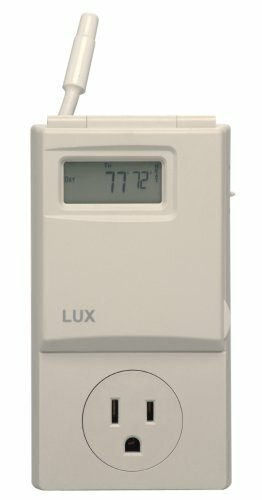 This LUX product has the same features as the LUX thermostat for out home furnace, which has worked fine for years. It has the same 4 periods per day that can be set to different temperatures as well as weekends that can also be different. Also the 4 periods per day can be whenever you want. This is a good idea for a product. Most space heaters have poor thermostatic controls, so just leaving the heater on and having it controlled through this product would be far more accurate. (NOTE: Won't work with a digital controlled heater that would not come on if you unplugged it then plugged it back in....which is basically what this does.) We use it to run an "Eco-heater" in baby's room to keep it at exactly 70 degrees at night so we can turn off the furnace at night. I set the day periods to be at the lowest possible temperature, which essentially keeps the heater off during the day. I never have to touch it. Good price too. The LUX WIN100 Heating & Cooling Programmable Outlet Thermostat is the perfect solution for heating or cooling one room. I purchased three (3) units: one for each bedroom hooked up to a small oil-filled radiator to heat the bedrooms in the winter. I don't like forced air heating because it dries out the air too much. This has not only allowed us to breath comfortably at night, but also cut my electric bill. Although we broke record lows this fall (avg of 30-40 degrees every night for the month of November), my electric bill was the no higher than an avg November. I was expecting a $200-$300 electric bill and it was only $150 for Nov. Not bad for an all-electric three bedroom home. With the ability to program the temp for each day (four time settings for M-F, and four times for S-S) The Lux WIN100 Heating & Cooling Programmable Outlet Thermostat takes all the work out of remembering to turn on or off the heat (or air). For example, you could set the thermostat to 68 degrees at 9PM, 65 at 3AM, 72 at 6AM, and 60 at 8AM. This could be the M-F setting. You could set the temp for four different times for S-S as well. Another nice feature is the ability to program the unit without having to be plugged in (armchair programming) thanks to the backup batteries, included. They are of the button cell type, and are supposed to be replaced every year, but I think I will just wait until they die. And last but not least is the "hold" button, which allows you to manually adjust the temp and keep it there, thus overriding the programmed temp settings. It will stay at that temp until you press hold again, thereafter returning to the programmed setting. The thermostat is rated at 120VAC, 15A -- enough power to run most space heaters or A/C units. The unit will operate manually operated heaters (not digital) and manual or digital A/C units if the digital A/C unit has auto on capability after power failure. The thermostat works by cutting the power to the heater/AC unit once the desired temp has been reached. So many uses and ideas came to mind after my Purchase. I control my Heat and Air. Great simple to use and program. It will save you hundreds of dollars in the coming years.